The final project for the class I'm taking is due the Monday after Thanksgiving. I had to laugh when I noticed that the middle tag in the picture says "Ho Big Red". Either the project is getting to me or my sense of humor is getting more warped. I'm going to use these for Unity's Friends with Flair and Ippity's Chick Challenges. Oh, and thank you to whoever did the music on canvas thing a couple of weeks ago. I had to try it because it looked so cool. These are wonderful tags!! Love the scallop borders and the canvas!! Great job!! Gorgeous tags-- I am definitely going to need to get my hands on some canvas. What perfect and gorgeous tags!!! Love the colors!!! Fabulous tags! I so need to do some tags, I have seen too many cute ones and I want to make some!!! Gorgeous tags, so many cute details! your tags turned out super cute. Oh my gosh, these are adorable! Love the dimension and the papers you used! Too funny on the 'ho big red'...chuckle. 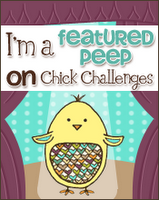 Thanks so much for playing with us at Chick Challenges (I still need to create from the sketch)...I love these tags! I wondered about the ho.....maybe you should change it to ho ho ho? LOL! Hopefully the recipient will notice the beautiful tree and "NOEL" and not the "ho big red." :) I LOVE the tags...totally fabulous! Have a great vacation. Great tags! They are so pretty! LOVE these tags! HO big red!!!! too funny! 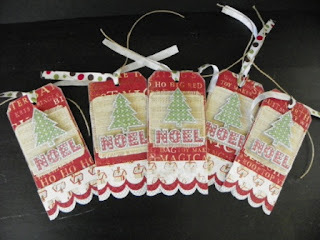 These are fabulous tags... even the "ho big red" one! :P Lots of fun details. Oh, gosh, these tags are terrific! Your design is perfect--so pretty and a great way to use the awesome stamps in this set. Love it! what an awesome set of tags!! love the ho big red!